Another great racing weekend is almost in the books. 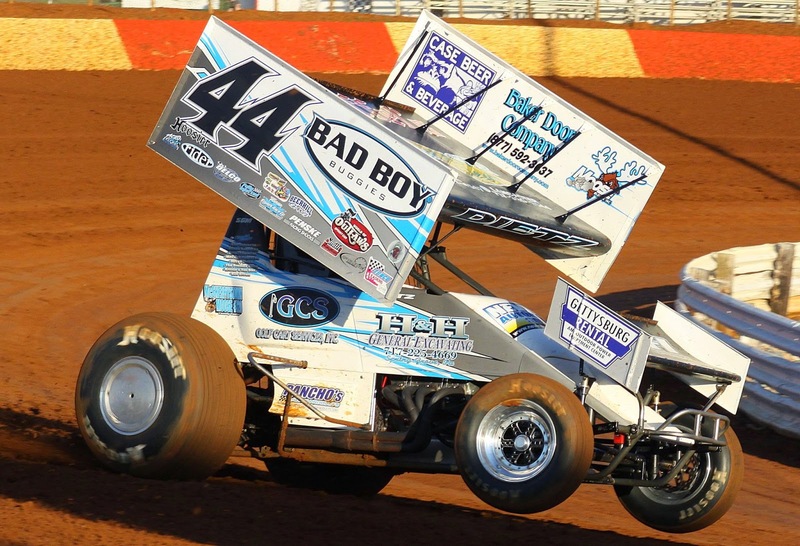 Great weather greeted the fans and race teams in Central PA this weekend and the racing action was just as hot. Before we get started on the racing action I want to say THANK YOU to all the brave men and woman who have served this great country of ours as we think about them this Memorial Day. Without all of you fine and brave people non of us could make it to the track every weekend to enjoy watching our favorite drivers race. 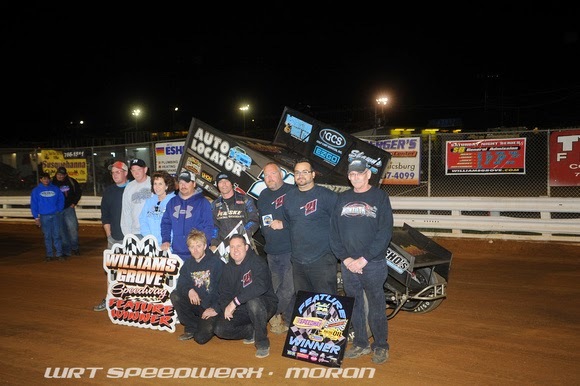 "The Edge" and his crew after win number 6 on the season Friday night at Williams Grove. Friday night at Williams Grove Speedway Brian Montieth scored his 6th victory of the season and third in four weeks at the historic half mile. It was a 2 car show with the 2 best drivers in Central PA racing hard for the win. Brian would edge Danny Dietrich. Depending on your vantage point the race was either very exciting, or very boring. Ive heard from many fans who claimed the race was boring as the track took rubber very early in the night causing choo choo like racing conditions. Heard from others the race for the lead was worth the extra $4 admission. I'll let you all decide which side of the fence you sit on. Isaac Sneeringer celebrating his 3rd win of the season Friday night at Trail Way Speedway. Down at Trail Way Speedway the fans where treated to another great battle for the win in the 25 lap 358 feature event. 358 Rookie of the Year contender David Holbrook lead the first 18 laps with Isaac Sneeringer, Matt Campbell, and Seth Kearchner right on his back bumper in lapped traffic. Holbrook was to cautious trying to get by a lapped car and held up the other 3 guys for a few laps. Sneeringer showed great patients in waiting for the right time to make the winning pass. Matt Campbell might have been the fastest car on the track but tried a move on the high side in turns 1 and 2 and would make contact with the lapped car sending them both spinning. Campbell would have similar trouble the next night at Lincoln Speedway. Sneeringer would pull away the last few laps to score win number 3 on the season. 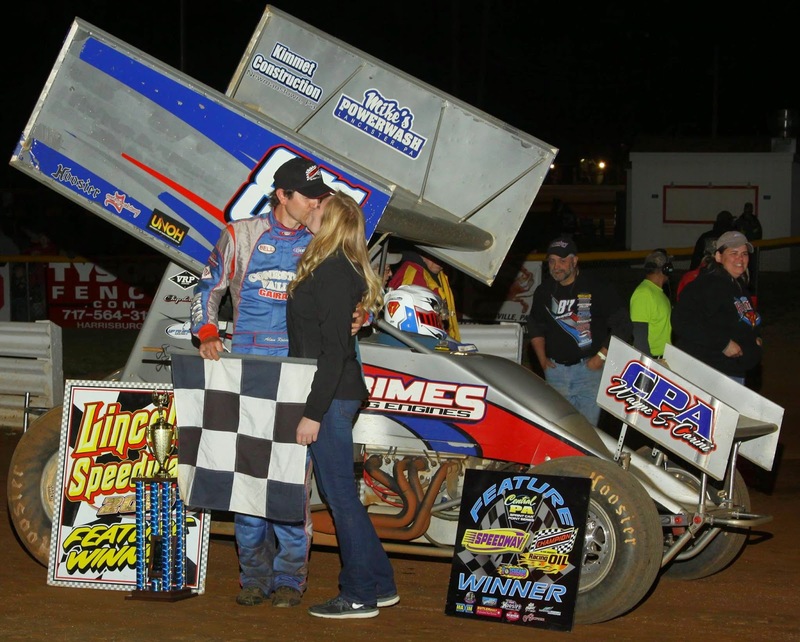 Steve Buckwalter in Victory Lane on May 2nd at Port Royal Speedway. 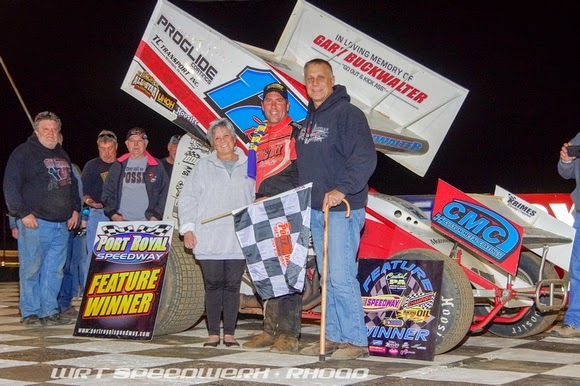 Saturday night at Port Royal Steve Buckwalter would pick up his 2nd feature win in the month of May at "The Speed Palace". Good for Steve. Steve is one of the nicest guys in the pits, not to mention one of if not the most diverse drivers walking around the sprint car pit area. Plus its great to see a low buck team get another big win this early in the season. Aaron Ott continues to impress everyone in 2015 with another solid 2nd place finish. Good to see hm running up front after two bad wrecks in two years left him on the sidelines with neck issues. Brock Zearfoss would score his best career 410 finish on Saturday night as well. Not sure how many people remember it was just a few years ago Brock broke his leg in a bad wreck at Selinsgrove Speedway. In his 2nd full season in the 410 division Brock is showing great improvements. 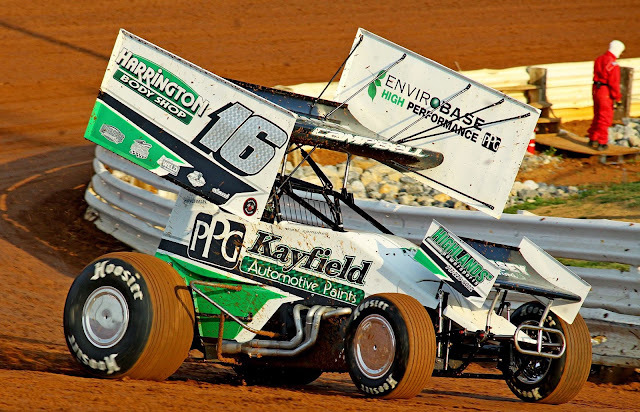 Fast time the other week at Williams Grove, and now a top 5 at Port. That first win is just around the corner. How long can Brent Marks keep this top 5 streak going without picking up a win? To the victor goes the spoils. Alan getting a big wet 1 from his GF in Victory Lane. Danny Dietrich stared 12th in the 30 lap Hilly Rife Memorial and after pole sitter Scott Fisher would lead the first few laps before giving way to a 2 car battle between Dietrich and Tim Gladfelter. Danny would get the lead and was checking out on the rest of the field, only to spin in turn 4 collecting Adam Wilt in the process. Reports from a crew member says their might have been something on the track which caused the 48 to spin. That would make sense since Danny is not known for loosing control of his sprinter. Either way it handed the lead back to Galdfelter who tried to hold off eventual winner the 11th starting Alan Krimes. The big news was at the start of the feature. It looked like Tim Gladfelter got together with Brandon Rahmer on the front stretch which caused the youngster to go flipping violently down into turn 1. Austin Hogue, Glendon Forsythe, Gerard McIntyre and Robbie Kendell all would get caught up in the mess with Kendell also flipping. Looked like Fred Rahmer was not happy with Gladfelter for the incident and had to be restrained and pulled away from the car which was sitting on the backstretch during the red flag for the wreck. Now I'm not going to go into this to much, but this is not the first time Fred has done this to other drivers, and something needs to be said to him by the track. Lost to some was the great racing action back in the pack. Jimmy Seigel and Chase Dietz who both started in the last row raced their asses off to get top 10 finishes, 6th and 9th respectively. Freddie Rahmer would restart at the tail end of the field after spinning in turn 4 and race his way back to a 7th place finish. All told there was more passing last night at Lincoln in the 410 feature then we might see all season at other tracks, and no excuses are needed, just say yes it was a damn great race. 18 year old Chase Dietz pulling up the front wheels exiting turn 2 at Lincoln Speedway. I have been beating the drum for years about the youth movement in Central PA sprint car racing, and last night at Lincoln Speedway is a perfect example of it. Look at the young drivers in the top 10 in both divisions. Matt Campbell spun while leading the 358 feature and he is only 16 yrs old. Add in Chandler Leiby, Ashley Cappetta, Tyler Esh, Wyatt Hinkle in the 358 feature along with both the Rahmer boys, Dietz, Hogue, McIntyre, Hoff and Tyler Ross who are all still under 25 years of age. But hey lets ignore all that young talent until some deem them ready for prime time. Matt Campbell in racing action at Lincoln Speedway. Wanna take a minute to give a shout out to Kristina Chambers and the whole Slicks and Sticks crew for all of their hard work in helping to promote the 410, 358, and 305 sprint car racing here in Central PA. Kristina host a radio show on Monday and Thursday nights called .... you guessed it Slicks and Sticks which covers both NHL hockey on Monday nights and everything sprint car related on Thursday nights. You should check out the show Slingin Dirt for some real and honest opinions on everything sprint car related. Her interview last Thursday with Kevin Nouse is a must hear for every sprint car fan. You can check out their website Slicks & Sticks and listen to all the older shows as well as catch the new ones every week. Your doing yourself a major disservice by not checking them out. Thats it for this week. 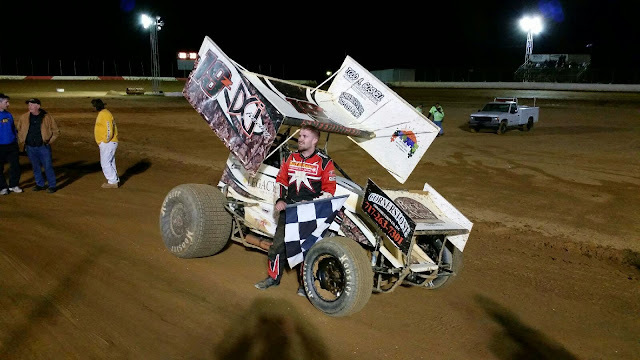 Thanks again for taking the time to check out my thoughts on the racing action here in Central PA. Hope everyone has a great time tonight at Selinsgrove Speedway as they host the Ray Tilly Classic for the 410 sprint cars. Next week Williams Grove is back with a 410/358 double header (thats where my but will be parked) while Trail Way Speedway once again host the 358 sprints at the bullring. Saturday night Port Royal will host the 410s as well as hosting the Charlie Grinestaff Memorial Late Model Speedweek race. 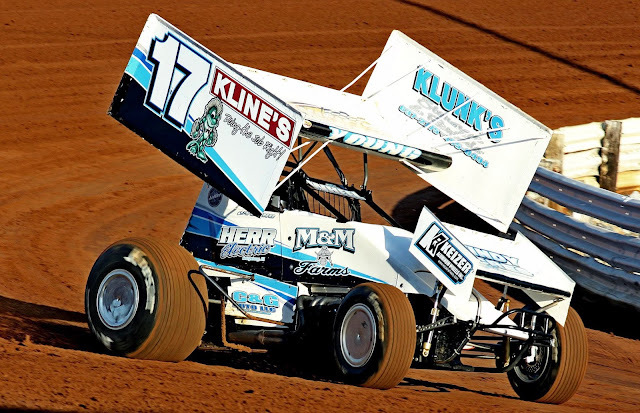 Lincoln has the 410s and 358s back on the card , and Selinsgrove will host the 360 sprinters for a regular night of racing action on the fastest half mile on the east coast. Till next weekend, have a safe and enjoyable rest of the weekend. Hope the week goes fast folks because I cant wait for Friday night to get here. Until then I hope your work week goes quick, your beer is ice cold (with a little dirt on top), and the racing action is red hot..